Undulation and Sea Sponges by Peruvian artist Karen Macher Nesta in the background. Sculpture by the Sea opened at Cottesloe in WA today. 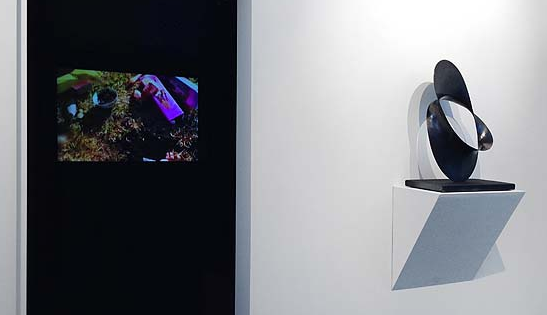 It is such a beautiful place, and it’s great to see it come to life with people of all ages coming to see the 77 artworks exhibited this year. 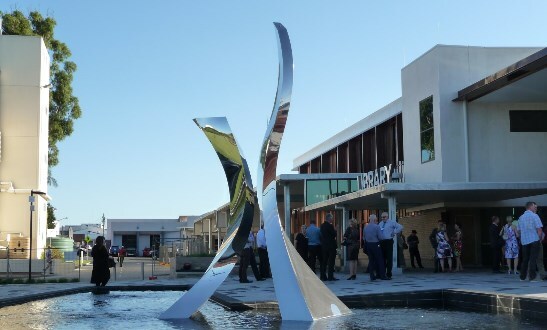 Alcoa kindly offered sponsorship for the aluminium used in the sculpture Undulation. Thanks to everyone involved, not least all the Sculpture by the Sea staff who are very dedicated and a joy to work with. 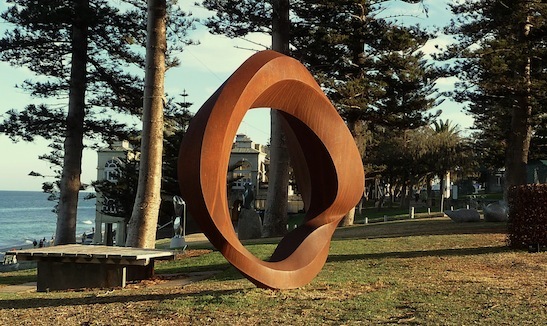 Sculpture by the Sea will finish on the 20th of March, so make sure you go if you are in the area. 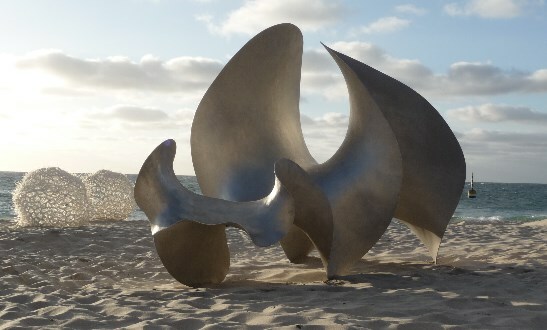 Sculpture by the Sea opened today at Cottesloe, see their website for further details. Constellation goes back to an earlier fascination with crystalline geometries, combined with a twisting,rotating motion, as if in a state of change. The name was more of an afterthought, since after drawing it up I thought it was stellated, i.e. with extended points, to stars, to the realisation that it was linking four points in space, like the Southern Cross. Constellation is hammer and press-formed from Corten steel and measures 2×1.8×1.3m. great place, lovely people and an amazing diverse display of art, well worth a visit. . .
Will add some more photos later. . . This year includes works from Andrew Best, Walter Brecely, Marguerite Derricourt, Todd Fuller, Lisa Giles, Lorraine Guddemi, Emily McIntosh, Al Munro, Mylyn Nguyen, Leslie Oliver, Benjamin Storch, Greer Taylor, Lezlie Tilley, Peter Tilley and Jacek Wańkowski.